MESA – Two years ago, when she became a Mormon, Andrea Hunt faced opposition from her staunchly Catholic Guatemalan family. “They’re very Catholic,” said Hunt, now 24. Hunt, who is married to former Mormon missionary Ryan Hunt, said her Catholic family grew to accept her conversion once they witnessed her happiness. The Hunts are expecting their first child soon. 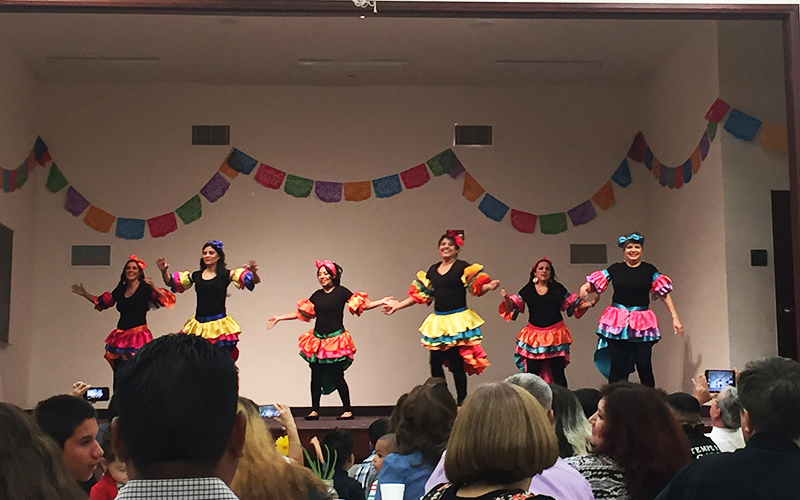 The Hunts recently attended Noche Hispana, an evening meant to honor Latino members of The Church of Jesus Christ of Latter-day Saints who attend a Spanish-speaking ward in Mesa. At the Noche Hispana celebration, tables were covered with plates of ceviche, tostadas, pupusas, empanadas. A mariachi band played. Sounds of laughter filled the room. Performers wearing costumes native to their countries danced traditional dances. The ward has members from Brazil, Honduras, Argentina, Mexico and other countries. The local effort to honor and include Latinos shines a light on the church’s successful efforts to recruit Hispanics. NBC News reports that Latinos make up the “fastest growing group” in the church worldwide. The Mormon church has over 15 million members worldwide, according to the LDS Newsroom. There are about 6.5 million Mormons in the United States, the church says. The Pew Research Center reported in 2009 that Latinos made up 7 percent of the church in the United States. By 2014, Latinos made up 8 percent of the church. Cronkite News called the Church of Latter-day Saints news department several times over the span of two weeks seeking numbers of Latino members in the church. Eric Hawkins, the church spokesman, was unavailable for comment. The large influx of Latinos into the church has likely impacted the church’s stance on immigration, said Dr. Sujey Vega, an assistant professor of Women and Gender Studies at Arizona State University. In 2010, the church supported the Utah Compact, which argued for federal control of immigration over state immigration laws. Vega, who researches the historic locations and growth of the Phoenix Latino community in the LDS Church and the role of family in the church, theorized that the Utah Compact was a response to the large Latin American influx in the church coupled with concerns about legislation targeting undocumented immigrants. “In the last 20 to 30 years there’s been a significant increase [Latinos in the Mormon Church] both in Latin America and in the U.S.,” and the growth is attributable in part to heavy recruitment by Mormon missionaries, she said. Bishop Mark Neville, serves in the Spanish speaking ward in Mesa. He had been a missionary in Bolivia, Peru and Chile, speaks fluent Spanish. He said he is a retired Tempe police officer.